Hoje, no podcast, eu falo sobre como foram minhas mudanças de casa aqui em Londres.. Não perca :-) Enjoy! Hi, what’s up? You’re listening to the new episode of the Inglês Online podcast. Thank you for telling everyone you know about this podcast and, enjoy! So, if you’ve been listening to this podcast for any length of time you may know that, about four and a half years ago, I moved to London in the United Kingdom. I have since moved house a couple of times and today I would like to tell you a little bit about my experiences and hopefully offer a bit of relevant vocabulary. So when I first arrived in this country I had only two suitcases with all my stuff in them. Yes, only two very large suitcases. I left some things behind in Brazil but I managed to bring mostly everything with me.. So that wasn’t too complicated. Now… we start accumulating stuff after we’ve settled somewhere, don’t we? I do, anyway. So. Fast-forward to two years later, when I moved house the first time. I had to hire a van. Now, mind you, it’s not like I filled up the van. No, there was still plenty of space in the van after the driver loaded all my stuff into it, but I definitely needed help because in addition to my original pair of suitcases I now had a couple of bags and two or three boxes. Thank goodness such services are available! You can hire them off the internet – there are plenty of choices. 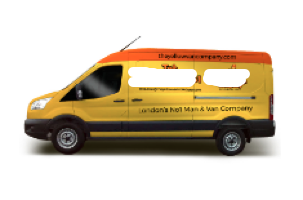 So I picked a van service that seemed pretty reliable and was not disappointed. The driver was a Hungarian guy, very strong, obviously – ’cause his job is to carry boxes and furniture… I rode along with him in the van to my new place and while we chatted he told me that he had been in London for many years and there were many other Hungarians living in the UK, working and saving up money. OK, no surprises there. So a couple of years later I moved house again, and I hired the same van service to help with the move. This time around the dad of the owner of the company was the driver. Yep – he didn’t say that right away, but as we chatted and he told me about how he was born in the north of England but then he moved to Birmingham, where he’s lived for a while… Then he told me he worked as a builder, in construction, and he currently buys houses, fixes them up and then sells them.. it eventually came up that his son dropped out of college and started the van company on his own, and he’s doing pretty well. So when his dad comes around to London to visit, he pitches in as a driver. So it was pretty nice chatting with him as I recognised a bit of a Northern accent (he then confirmed to me he was from the North of England) but then I told him it didn’t sound like pure Northern (which was when he told me he’d been living in Birmingham for many years, which had changed his accent a bit). Birmingham is in the West Midlands of England. It’s good to see I can sort of tell a few of the local accents apart, since back in 2013, when I first moved here, I could barely understand some of them! Why don’t YOU tell me what it was like last time you moved house? Did you have to hire someone to help? Did your friends or family give you a hand? Talk to you next time. Hi teacher, i’ll share with you a thing that happen to me when i moved house. Well, i was moving from my old house and i was doing all good, but when i put my cat on my dad’s car and he started to drive, the cat get crazy and starter running around the car madly, scratching evebody! When se finally Came to our new house and opened the car’s door, my runned away and never come back. Well, your accent is very nice and it does not look like you are brazilian. You could tell and teach us ways to lose our Brazilian accent and stop making those typical mistakes in the end of the words, I mean, stop adding vowel sounds in the end of the words. I see – good suggestion – will add that to the list! In the meantime, have you checked out the Dicas de Pronúncia? Unfortunately I have not. But I shall do it, then I can tell u my impressions about it later. You always surprise me with your new posdcast!!! Thanks for sharing such ideas with us!!! I have been teaching English for over ten years and I must say that this is one of the best websites to learn English!!! You ought to have some postcasts with pronunciation tips!! It would be great to everyone in need of improving it!! Very happy to know it’s helpful. What would be your suggestion for a pronunciation tip? I came here to this page thinking of a podcast to listen and wondering if you were still working on new podcasts. I’m glad that you are! It’s incredible how I always learn some new expressions from your audios! I wasn’t familiar with “I have since done something” and I admit I’m kind of racking my brain to put this on my mind hehe…I gotta practice it. Thank you for providing such a great content for free. You rock!!! “I have since …” is not THE most common thing you’ll hear BUT it is still pretty common. Do you practice listening? If you do it regularly (and you would have a choice of materials since you seem to have advanced comprehension skills) you’ll surely start hearing it here and there, and will acquire this structure in no time. Abraço e continue por aqui!